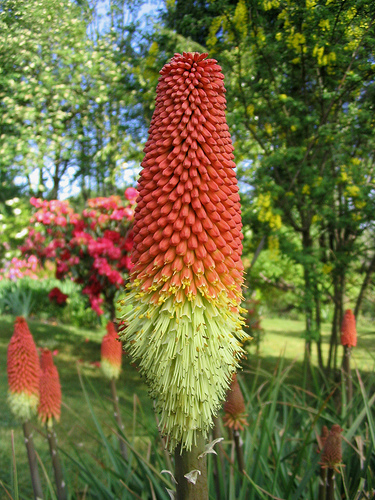 Kniphofia, also called tritoma, red hot poker, torch lily, knofflers or poker plant, is a genus of flowering plants in the family Xanthorrhoeaceae, subfamily Asphodeloideae, that includes 70 or more species native to Africa. Herbaceous species and hybrids have narrow, grass-like leaves 10-100 cm (4-39 in) long, while perennial species have broader, strap-shaped foliage up to 1.5 m (5 ft) long. All plants produce spikes of upright, brightly colored flowers well above the foliage, in shades of red, orange and yellow, often bicoloured. The flowers produce copious nectar while blooming and are attractive to bees. In the New World they may attract sap-suckers such as hummingbirds and New World orioles. Israel's agriculture represents 2.5% of total GDP and 3.6% of exports. While agricultural workers make up only 3.7% of the work force, Israel produces 95% of its own food requirements, supplementing this with imports of grain, oilseeds, meat, coffee, cocoa and sugar. 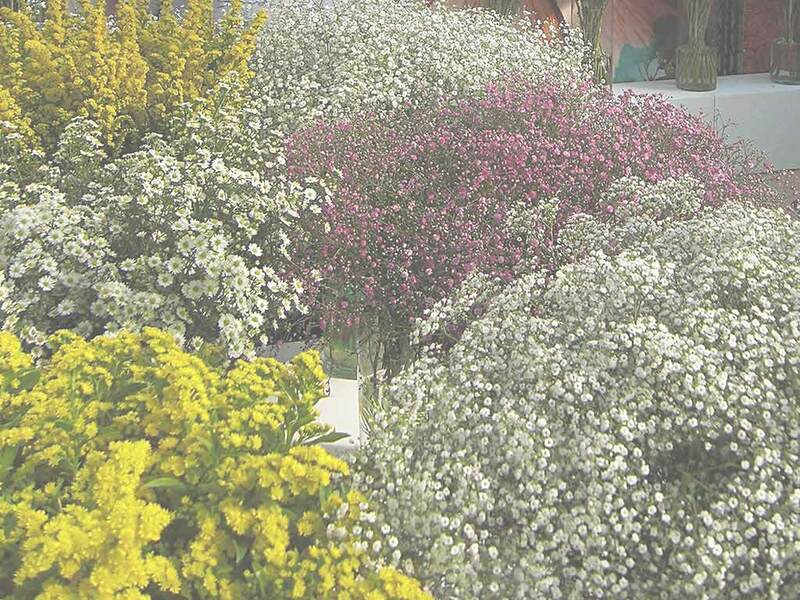 Farm fresh grower-direct flowers from following varieties: narcissus, gypso, limonium, gerbera standard, astilbe, moluccella, solidago, gypsophila, prothea, matthiola, campanula, achillea, craspedia, wax flower, strelitzia, gomphrena, roses, ozothamnus, leucospermum, tanacetum, calla, liatris, hippeastrum, anemone, kniphofia, veronica, alstroemeria, ixia, carthamus, aconitum, iris, sunflower, asclepias, green bell, freesia, phlox, eremurus, chrysanthemum, echinops, bouvardia, rose spray, paeonia, dianthus, crocosmia, eustoma, ranunculus, tulip, godetia, roses small head, desert yearning, banksia, curcuma, cotton, statice, agapanthus, kangaroo paw, gladiolus, trachelium, lilium, grevillea, lisianthus, antirrhinum, aster, anigozanthos, gerbera, delphinium, globularia, gerbera mini, capsicum, roses tea, matricaria, ornithogalum, celosia, etc. Fresh cut foliage of the following varieties: eucalyptus, kochia, ruscus, prunus, monstera, aspidistra, salix, murraya, chondropetalum, viburnum, euphorbia, agonis, leucadendron, cotton, melaleuca, myrica, cycas, acacia, artichoke, croton, cyrtomium, myrtus, palm, rhamnus, hedera, bear grass, aralia, cocculus, asparagus, hypericum, grevillea, pittosporum, photinia, adenanthos, cyperus, fern, philodendron, steel grass, euonymus, myrsine, hibiscus, rotem, etc. Fresh herbs and lettuce salads from leading Israeli growers: chervil, coriander, sorrel, red chard, baby spring mix lettuce, salicornia, basil red, arugula baby, thyme, spinach, parsley flat, parsley curly, tatsoi, basil green, marjoram, lemongrass, lemon balm, chives, arugula, tarragon, mizuna, rucola deluxe, baby mix salad, basil, rosemary, sage, dill, bulls blood, lollo rosso lettuce, romaine lettuce, savory, oregano, arugula deluxe, marjoram sweet, rucola baby, rucola, lemon grass, mint, peppermint, etc. Used as spices and seasoning herbs herb in recipes of healthy food cooking. All year long best price fresh herb and salad wholesaler supplies. Our produce can be delivered worldwide by air cargo carriers to the following international destinations: Poland, Brazil, Turkey, Ecuador, Belarus, Canada, Iceland, Argentina, Gibraltar, South Africa, Luxembourg, Norway, Uruguay, Sweden, Costa Rica, Australia, Bolivia, Belgium, Finland, Lithuania, Colombia, Philippines, Paraguay, Nicaragua, Thailand, Denmark, Netherlands, Moldova, United States, Cyprus, Georgia, Holland, Switzerland, Malaysia, Indonesia, Uzbekistan, Republic of Ireland, Kazakhstan, Greece, Czech Republic, Austria, USA, Hong Kong, Laos, Spain, India, Turkmenistan, France, Portugal, Andorra, Russia, Latvia, Macedonia, Croatia, Italy, Liechtenstein, Peru, New Zealand, Tajikistan, Singapore, United Kingdom, Mexico, Slovakia, Hungary, CIS countries, Sri Lanka, Kazakhstan, Kyrgyzstan, Ukraine, Chile, Romania, Azerbaijan, Ukraine, UK, Slovenia, China, Vietnam, Armenia, Monaco, Venezuela, Estonia, Panama, Bulgaria, Bosnia, Japan, Taiwan, Germany, Belarus, Malta, South Korea, etc.